Our new Airstream needed a name. We couldn't just keep calling it "the Airstream" or "the trailer" - just seemed way too impersonal. Boats have names, so why not our trailer? On one of the first camping trips in our Airstream, it rained and blew, and then rained and blew some more. Later, the weatherman would report it had been a hellacious storm; we experienced heavy rain and gusts of up to 60 mph - on the road and in camp. Since it was awful outside and lovely inside, we listened to a narrated version of John Steinbeck's Travels with Charley. We liked the story so much that we named our trailer after his camper, which he called Rocinante after Don Quixote's horse. It's a great story, a true American Classic. If you haven't read it yet (or had it read aloud to you), we highly recommend it. It will put you right in the mood to have an adventure of your own! To make it official, we decided to get a nameplate for her. 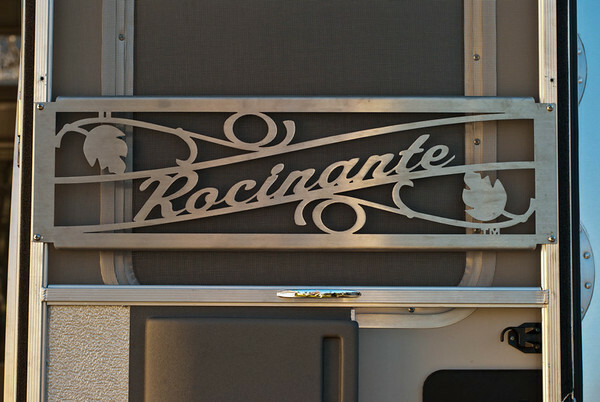 After considering a few options, we ordered a door guard from David Winick of Winick Design at Vintage Trailering. We're very pleased with the results. We liked the guard so much that we mounted it on the inside of Rocinante's door so we can see it from the inside, or from the outside when all the doors are open.